The Communist Party of the Philippines (CPP) has expressed support for Friday’s protest actions against the burial of the late President Ferdinand Marcos at the Libingan ng mga Bayani. “By protesting the hero’s burial of Marcos, the Filipino people, especially the younger generation, are demonstrating how they have not forgotten the brutalities and crimes of the Marcoses,” the CPP said in a statement. “Beyond recalling Marcos’ crimes of the past, they must also unite to fight all the brutal legacies of martial law which persist and continue to cause grave suffering against the people,” it added. At the same time, the CPP urged the public to demand from the Duterte administration the reversal of the “historical wrong” of having Marcos at the heroes’ cemetery. “The Filipino people must demand the Duterte regime to reverse the historical wrong which it committed by exalting Marcos with a hero’s burial,” the CPP said. Aside from these, the CPP highlighted the importance of calling for the release of political detainees during the protest actions, saying that most of them are victims of the Marcos dictatorship. “The people must demand Duterte to prove himself not a Marcos by fulfilling his promise to release all political prisoners en masse through an amnesty proclamation,” the CPP said. “The CPP urges the protestors in Metro Manila and other cities demonstrating against the hero’s burial of Marcos to unite with the people in the countryside who continue to suffer under martial law conditions with the presence of armed soldiers of the AFP who maraud and ravage their communities with the aim of suppressing the struggle of the peasant masses for genuine land reform and the minority people for self-determination,” it added. The CPP rejected President Rodrigo Duterte’s justification that Marcos’ burial at the heroes’ cemetery is in accordance with the law. “Duterte can propound a thousand legal questions and he would not get to the meat of the matter because the issue of exalting Marcos as a hero is way beyond the realm of what is legal or not,” the CPP said. “It is a question of whether one sides by the dictator who protected the interests of foreign big capitalists, the big bourgeois compradors, the big landlords and bureaucrat capitalists through the brutal suppression and exploitation of the people,” it added. But for the CPP, Duterte’s statement only showed insensitivity and disrespect to the victims of the Marcos dictatorship. 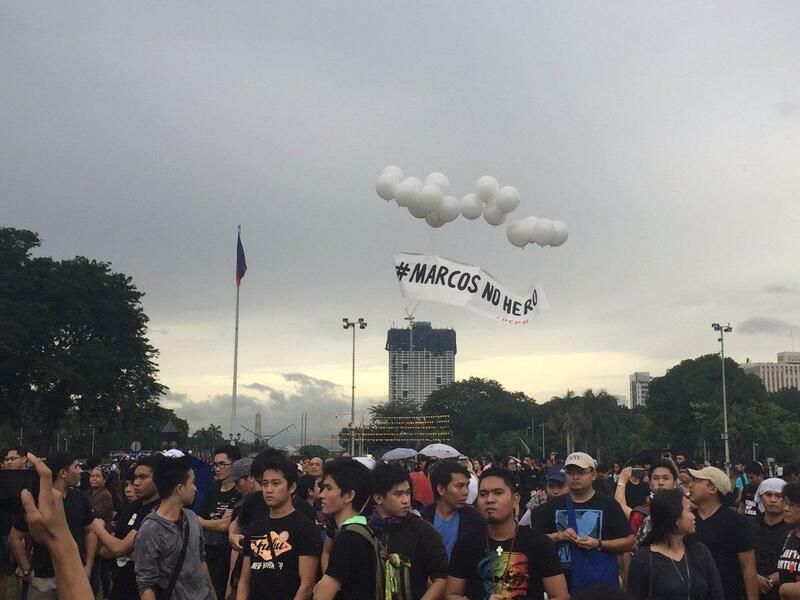 “Indeed, by exalting Marcos with a hero’s burial, Duterte showed utter insensitivity and disrespect to the tens of thousands of victims of cruel suppression by the US-backed Marcos dictatorship and the collective suffering of the Filipino people under its rule of unmitigated plunder,” the CPP said.